In honor of another album from outer-space from Icelandic space diva, Bjork, we figured it would be appropriate to list our top ten artists from Scandinavia, the land of the vikings, icebergs, and socialism. Sweden, Denmark, Norway, Finland, and Iceland: we are looking at you. And while we didn’t have the cajones to put ABBA on the list (we aren’t that comfortable with our sexuality), here are ten artists totally worth a musical voyage. Disc 2 of The Powers That B will be titled jenny death, and is set for release later in 2014. Get ready to rage! On the surface level, I think it’s natural to have some preconceived notions of what a festival put on by Pitchfork may be like. Pretentious I would imagine is the first thing that would come to many people’s minds. An uppity crowd filled with music snobs and young folks more focused on style than substance. You’d probably also assume that following suit with any other festival/venue it would provide nothing but overpriced food and beverages that would be moderately annoying to wait in line to get as well. The lineup can also be a bit off-putting for some. Unsure of all the names on the lineup seems to be a problem for even dedicated music followers at times as Pitchfork likes to stick with very highly acclaimed (even if it is themselves in fact acclaiming them) list of acts. Not to mention the staggeringly small number of acts for a three day festival that pales in comparison to that of a Lollapalooza, Bonnaroo, or Coachella. After attending this festival for the second time, I have to say that I am continually amazed at how far off base all of these notions are. Every one of them. The crowd is amazingly genuine. It is smaller than most fests, but people there seem to be genuinely into music. I attribute this largely due to the fact that Pitchfork’s lineup is not conducive for the teenie-bopper types that are looking to attend a three day festival to simply see one show a day whether that be Monsters of Men or fun.. All of the fans at Pitchfork seem to genuinely be there to enjoy all music. As far as price goes, there is hardly a bar in Chicago where you can get craft beers for $5, let alone a spectacle venue. Food is also moderately priced, from local Chicago restaurants, and very delectable. The lineup, whether you know the artist or not, is wonderful. Every act you see there (or at least that I saw there) is someone I would pay a full priced ticket to see as headliners. And the fact that this number of acts on the list is smaller than most, only provides strong set times, and less conflict from overlapping acts. All-in-all it has to be the US festival with the most bang for your buck. Now let’s get down to brass tax shall we? This one is pretty self explanatory. As our final recap of the event, here is our favorite acts of our favorite festival. I’ll give you a hint, Mumford and Sons didn’t make the list … or did they. Tame Impala’s groovy Aussie vibes translate well to the stage. Especially for an afternoon festival setting. There is no doubt these guys will only be growing in fans as the years progress. I wouldn’t be surprised seeing them graduate to a stage soon enough. Following in our week of Bonnaroo coverage which started yesterday with a full artist-by-artist recap, today we give you our five favorite moments of Bonnaroo this year. Every year Bonnaroo comes around, the Tennessee Festival brings a smattering a great moments, especially lots of moments with artist collaboration. I would say Bonnaroo has more of a collaborative culture than any other festival I have been to, so every year I go in not just excited about seeing my favorite artists, but excited to see what surprises might come about. And this year was a new record in terms of surprises. 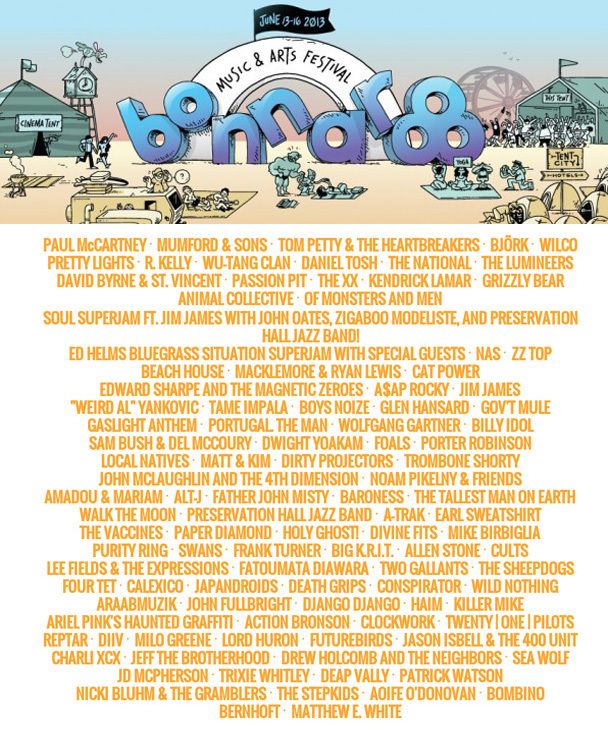 So here are our five favorite moments of Bonnaroo 2013. The time has come for our favorite festival announcement of the year. If you’ve been following us for a while, I’m sure you’ve heard us gush over the glories of the Bonnaroo music festival on more than one occasion. If you are new to LxL and continue to follow us, I promise this won’t be the last you hear of it either. Today the full lineup was finally released. Rumors of Paul McCartney and and Wu-Tang Clan came true, while others such as Jay-Z, Justin Timberlake, and Yeah Yeah Yeah’s fell short. One thing that I have found with music festivals is that each year the immediate reaction to an actual lineup announcement seems to be increasingly less exciting than the anticipation and wonderment of who will be there. Not that I am not excited about this year’s lineup, because I am, but I think that everyone’s expectations always seem greater than what they should be. This is mostly due to rumor-mills, fake posters, and people’s assumptions based on who is touring at the time, who is coming out with and album this summer, or who recently had just toured. All that to say, there certainly exists some major disappointments such as the lack of Jack White (again), no Yeah Yeah Yeahs, and no sight of Thom Yorke’s new collaboration Atoms for Peace.